Happy Wednesday friends, halfway closer to the weekend! I am trying my hardest to sit down and meal plan on Sunday's with Scott. We had gotten into such a bad habit of last minute trying to throw something together and often eating after the little ladies went to sleep, which meant Mama was #hangry by the time I sat down to eat! So, I'm proud to announce that we actually meal planned this past Sunday, went to the grocery store AND bonus, have sat down as a family in the dining room for our dinners this week and it feels SO nice! 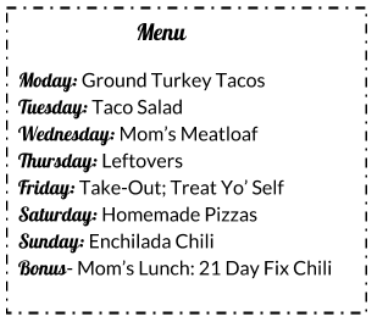 I figured I would share our weekly menu with all my friends on Wednesdays, just in case you would like to use our meal plan and FREE SHOPPING PRINTABLE for your following week. Now, let me clarify, just because we meal plan does not mean things are about to get FANCY over here, we like to stick with the basics! I also try to think of meals that I can "un-do" for my little ladies, which means I don't need to think of a little something extra for them. 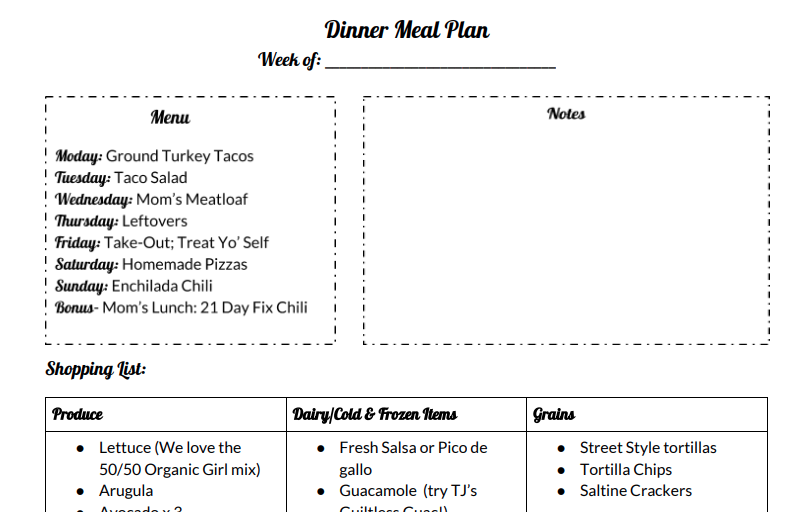 My goal is to add in one new recipe each week and we like to treat ourselves to take-out once or twice on the weekends! I keep meal planning super simple, I use a magnetic notepad that I stick to the fridge (usually from the Target dollar spot) and like to pick recipes from one cookbook for a month or so. This month I am working from Mix & Match Mama's Eats: Crazy Good Go- To Meals, this is such a great cookbook because the recipes are really user friendly, fast to prep and include easy to shop for ingredients. A lot of her recipes are twists on our favorite classics, which I always love! Bonus, Shay posts a lot of recipes on her blog, so I'm able to share a few of the recipes I'm making this week with you! Monday: Ground Turkey Tacos- I LOVE eating these with the Guiltless Guac from Trader Joe's, have you tried it!? It's delicious! We also love Trader Joe's fresh pico de gallo, it makes our tacos feel fancy. Little Ladies: My girls love "un-done" tacos, meaning they eat all the ingredients separate. I have also discovered "Street Taco" sized tortillas which are awesome for littles AND adults when it comes to limiting carbs. Isla LOVES ground turkey taco meat and literally shakes with excitement when we put some on her tray, yasss girl! Tuesday: Taco Salad- Using all the ingredients from the night before, just throwing it over lettuce, adding some crushed up tortilla chips, avocado and a little salad dressing of your choice! Mom Tip: I make a BIG batch of the ground turkey taco meat WHILE I am making lunch for my little ladies. That way at dinner time all we have to do is heat it up and enjoy! The mess has already been cleaned up and it makes things way less chaotic. 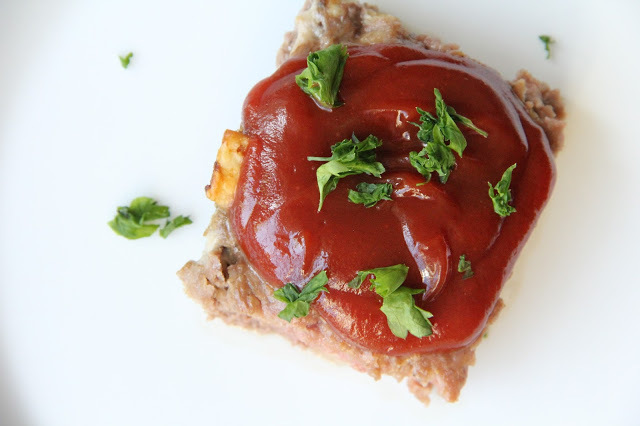 Wednesday: Mom's Meatloaf (MOMMM, the meatloaf!!!) w/mashed potatoes & side salad. This is one of the recipes I'm making from Mix & Match Mama's cookbook, it's on page 60 if you have the cookbook too! Bonus, this recipe is on her blog, you can read it here! Thursday: Leftovers- Are you a fan of leftovers!? I'm kind of picky when it comes to leftovers, but tacos any day of the week sounds good to me! I'm also lucky that my husband refuses to throw away any food and is more then happy to eat up whatever we have leftover. On a night like this, I may default to a quick and easy favorite of the little ladies like chicken nuggets or Trader Joe's fish sticks! Friday: Take-Out- Friday night is Mama's night OFF! Scott and I usually try to grab something once we get the little ladies down for bed, it's kind of our make shift date night during this season of life. The funny thing is, I like to treat myself to something like sushi and he likes to grab a burger and fries, in our house, everyone wins! Saturday: Homemade Pizzas- Have you tried the Trader Joe's pizza dough? Not the one in the freezer section, but the one that comes in a legit dough ball? It's delicious! They even offer a Gluten Free version if your family has some food restrictions. The little ladies love making their own personal pizzas with cheese, sauce and turkey pepperoni. I'm going to get fancy and make a sauceless pizza for Scott and I- EVOO & garlic crust, topped with arugula, squeeze of lemon juice, salt/pepper and burrata, SO good! You can find burrata at Trader Joe's or Whole Foods, it can also be found in the deli section in some grocery stores. Sunday: Enchilada Chili- This is another new recipe for me, again if you have the "Eat's" cookbook it's on pg. 158, but you can also find it here on Mix & Match Mama's website! I'm excited to try this one, I think the enchilada sauce will give it a nice kick and I'm planning on using ground turkey instead of beef. Little Ladies: My girls aren't big chili eaters, of course they gobbled it up as baby, but now they think it looks "yucky," I'll set aside some of the prepped ground turkey and add it to marinara sauce for them, because it's not a week in our house if the little ladies don't eat pasta! Bonus- Mama's Lunch; I try to make a big batch of something early in the week that I can easily heat up while the littles are napping, this way I don't default to just eating their leftover lunch scraps. 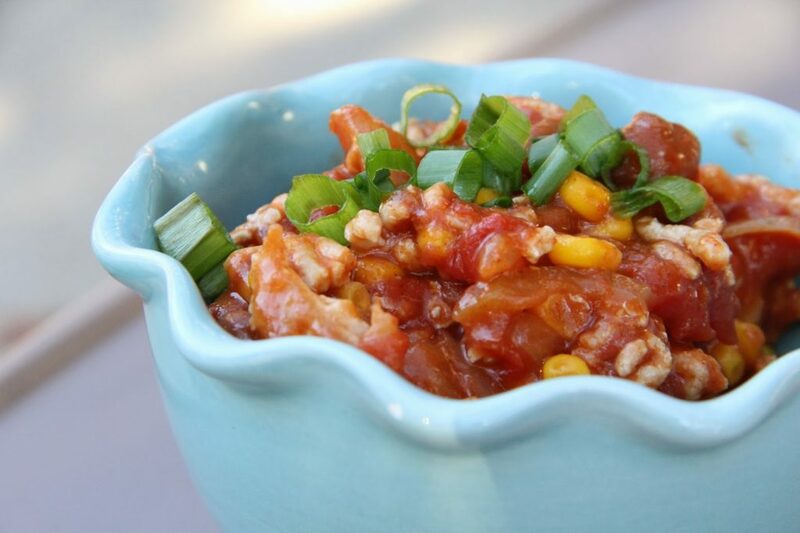 This week I'm stirring up a batch of 21 Day Fix chili that I found on Pinterest, you can find it on my Pinterest board. Click HERE for the FREE SHOPPING PRINTABLE- Meal Planning and grocery list are all prepped for you girlfriends, just add your weekly basics to the list and you are ready for a week of good eats! There ya have it friends, a whole week of meal prep/planning, let me know if you try any of these Mix & Match Mama recipes AND please link-up any of your favorite quick and easy dinner recipes in my comments. Are you following me on Pinterest? I have fallen in love with "pinning" again and have so many delicious recipes saved on my Recipes: Dinner board! I am SO happy that this is helping someone, I'm pretty convinced my Mom is the only one who reads these posts ;) Let me know if you try any of the new recipes, I made the Meatloaf tonight and it had me coming back for seconds! Take care!